Because our eyesight often changes and deteriorates gradually through life, we may not notice that our sight is not as it could be. Also, our eyesight can be something we take for granted, until something obvious or drastic goes wrong. In the eye examination, our eyes’ prescription is measured and compared to our previous measured prescription(s). From these measurements, the optometrist can give professional recommendations to us to help us get the best possible sight. He/she might recommend spectacles or contact lenses for general or specific use, or an update to our existing spectacles/lenses if our prescription has changed significantly. The examination will also check the health of your eyes, looking for signs of conditions such as cataracts, glaucoma and macular degeneration. We recommend our extended Premium examination to our new patients and then again at subsequent appointments. This includes retinal photography which can reveal sight conditions in their early stages, so that – with the right management – we can minimise the risk of the drastic sight loss that can occur if conditions are left untreated. 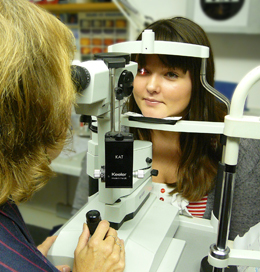 An eye examination can even reveal general health conditions to a skilled optometrist. If you are Diabetic, you will be advised, by Oxfordshire Diabetic Eye Screening Programme (ODESP) to have retinal photography each year and this will be funded by the NHS. We are an accredited practice and will be pleased to look after you. If you are a motorist, your eyesight needs to be to a certain standard. If you’re involved in an accident and your sight is shown to be below the legal standard, your insurance will be invalid and you could even face criminal charges. We are an approved DVLA sight testing practice and can help you to remain legal. 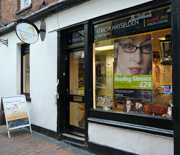 At Patricia Hayselden & Partners, we conduct thorough NHS and private tests, taking around 30 to 40 minutes, which may be longer than you’re used to: but time with the optometrist is necessary to test for and detect any possible sight conditions or diseases. Our first eye examination for new customers will include retinal photography and will be at the same level as our Premium examination, which is available to you at any of your eye examinations. Patricia Hayselden & PartnersWhy have one?